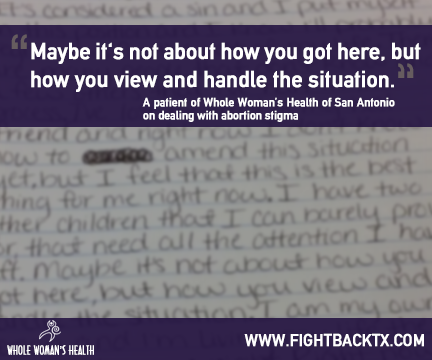 That was the epiphany that a patient at Whole Woman’s Health of San Antonio had while waiting to be seen by our physician for her abortion procedure. Her story, like many others’, starts out feeling uncertain, scared, and self-deprecating for choosing to not be pregnant at that point in her life. All of these feelings faded away as she deconstructed her own preconceived notions about abortion and realized that she is there because she was able to make a decision, one that she felt was best for her and the family that she’s already caring for. An important part about being able to choose whether or not to have an abortion is an important factor of freedom of choice in general. I wasn’t raised to believe in abortions. It’s considered a sin and I put myself in this position and I know I’ll probably regret this for the rest of my life. There are many people that don’t know and a few others that I’ve hurt in the process. I’ve lost the trust of my best friend and right now I don’t know how to amend this situation yet, but I feel that this is the best thing for me right now. I have two other children that I can barely provide for, that need all the attention I have left. Maybe it’s not about how you got here, but how you view and handle the situation. I am my own person and I’m living my life the best that I can right now. Right now, this is the best decision for my life and my future. Some people might argue against this by saying that at least she could “make some other family happy through adoption,” but let me tell you, it messes with children’s heads to see their mother carry to term and then give away the baby. It’s hard enough being a younger sibling after an adoption but it’s worse in some ways being an older sibling then. So not only does restricting access to abortion hurt women, it hurts their families too.